Let’s turn back the clock 30 years. Yours truly was tubby, aged 10, and at infant school. I was still happily playing with a tin of toy soldiers and nipping over the railings for a game of footie on the high school playing fields of a weekend (goalkeeper, obviously, because this asthmatic didn’t do much running about). Then things changed. 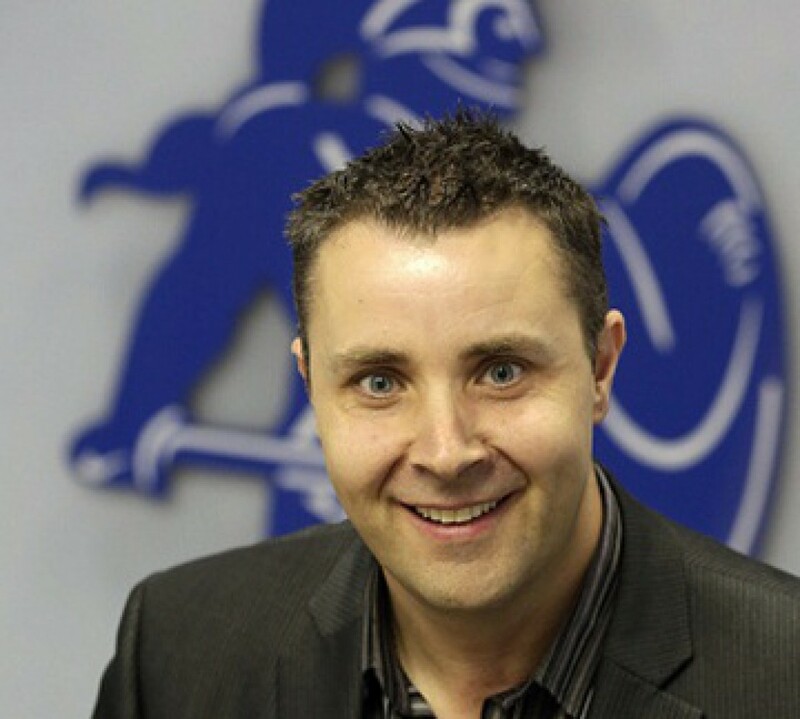 This was the year I looked beyond Sneyd Green and started to take notice of, well… other stuff. I think this was because 1982 was a momentous year – for all sorts of reasons. Indeed, I’m convinced it was the events of those 12 months which switched me on to current affairs. No, I’m not talking about the arrival of the BMX or the ZX Spectrum home computer – I had neither. Nor did I go in for Deely Boppers, ra-ra skirts or leg warmers – which all made their bow in ’82. I’m not talking about the launch of Channel 4 with its first edition of Countdown, either. No, what struck me when I watched the evening news was the crushing misery of real life. Unemployment hit three million for the first time since the Thirties and I learned what a dole queue was. Of course, there was no bigger story than the Falklands Conflict – which unfolded before our eyes on television from April to June. For a starters, my mum suggested we stop buying Fray Bentos steak and kidney pies because of their country of origin. She only suggested it, mind. As a 10-year-old I recall being worried as Maggie’s Task Force sailed off but I didn’t really know why. The Falklands Conflict was the first ‘war’ which us Brits witnessed via nightly updates on the TV news. For anyone who saw them, even a youngster like me, there are certain names and images which will be seared into your mind. Mirage fighter planes, Exocet missiles, Harrier jump jets, Goose Green, Mount Tumbledown, the blazing Sir Galahad, the sinking General Belgrano. For the 74-day duration of the conflict pictures were beamed into our living rooms every teatime – exposing for the first time the full horrors of war to us back home. In the end, we won, but the cost was steep: 255 British military personnel, almost 650 Argentine military personnel and a handful of Falkland Islanders died. Last year I met Simon Weston OBE – the remarkable survivor of that fire on the Sir Galahad – at a theme park in Cornwall of all places. He remains an inspiration. Television also provided other vivid memories of that year for me. 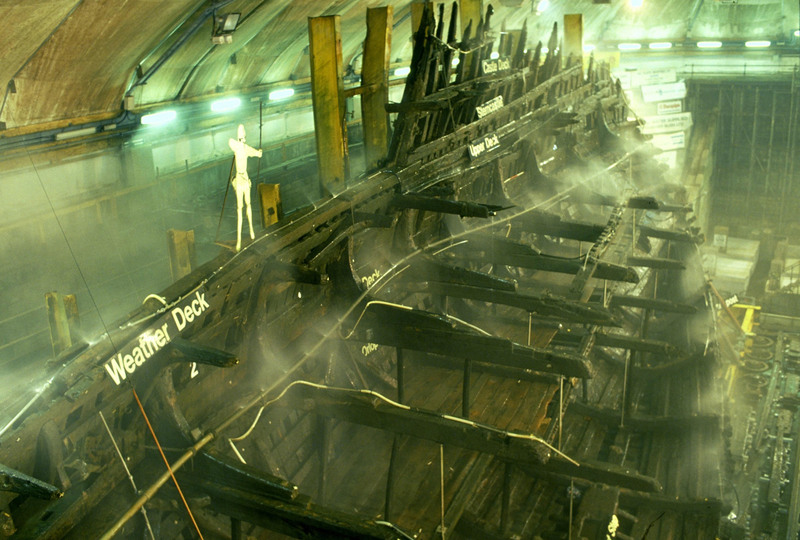 In October I was one of more than 120 pupils at Holden Lane First and Middle who huddled around the school’s only beast of a TV and watched as King Henry VIII’s flagship the Mary Rose was raised from the murky depths of The Solent. This was history at its most exciting and I was hooked for life. I also watched virtually every game of the World Cup in Spain and very nearly completed the Panini Sticker album for the tournament – eventually giving up on a couple of Hungarian midfielders. It was a year to be Italian and I recall the Boys’ Brigade lads playing football on the grass up at Wesley Hall Methodist church (trees for goalposts) all wanting to be Paolo Rossi. 1982 was also a year of contrasting royal stories. There was joy for the House of Windsor when Diana, Princess of Wales, gave birth to her son and future heir to the throne Prince William in June. But a month later I remember being horrified that the Queen had spent 10 minutes chatting to intruder Michael Fagan when she woke up to find him sitting on the end of her bed. Ten-year-old me was genuinely concerned about Her Majesty’s safety for several days after that. Thirty years later and our Liz is approaching her Diamond Jubilee so I guess I needn’t have worried. When you are growing up you come across people who leave a lasting impression on you. They help to shape who you are and how you think. Roy Harrison, who died this week at the age of 84, was just such a man in my life. Mr Harrison, as I always refer to him, was a colossal figure locally who leaves a proud legacy. I can’t tell you about Roy the family man, Roy the scientist or Roy the man who was instrumental in raising the funds to build Wesley Hall Methodist Church in Sneyd Green. However, I can tell you a little about Mr Harrison – the strict but kindly man who was a father figure to many young people like myself who attended that church. I recall the numerous shows and fund-raising fayres which he seemed to organise almost single-handedly. 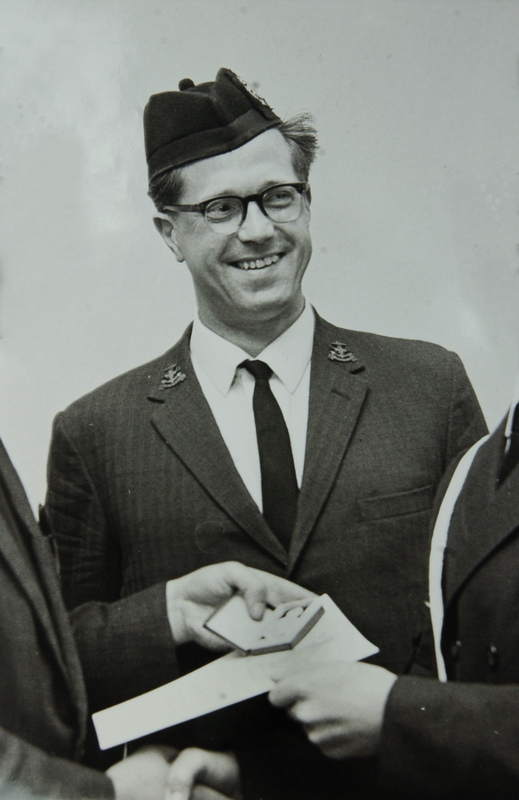 I remember him as the extremely dedicated captain of the 14th (North Staffs) Company of the Boys’ Brigade. I remember his voice and his valiant attempts to teach me and the other lads a bit of drill. I never did nail that ‘about turn’. I remember him leading our little band through the streets of Sneyd Green on a Sunday morning with yours truly bashing away on a side drum. I recall his pride when I represented the 14th Company in the Bible Quiz and didn’t get a single answer wrong. I remember Mr Harrison the sportsman, the choreographer and the musician. Never judgmental, always supportive, he was an incredibly inspirational man. He was one of those rare breed of genuinely driven, community-spirited individuals who enrich the lives of others through their endeavours. Thanks, Mr Harrison. I won’t forget you. There’s a lot to be said for never growing up. It is my personal defence mechanism against the slings and arrows that life throws at me. It also means that instead of being dragged down by the crass commercialisation of the festive season I squeeze every possible drop of cheer from the month of December. Instead of moaning about having to write tonnes of greetings cards to colleagues or the bunfight that is Christmas shopping up ’Anley, I look forward to both. Not for me the round-robin email prefixed by the less-than-convincing “I am giving £1 to the Save The Porpoise Foundation this year in lieu of Christmas cards”. On Christmas Eve I go to bed full of memories of staring into the night sky as a child – hoping against hope to catch a glimpse of something streaking across the sky – while praying for snow. I can honestly say that it wasn’t just about the presents, either. It was about singing carols at Wesley Hall Methodist Church (they were a blessed relief from the usual turgid hymns) and hearing the wonderful tale of the first Christmas. It was about the thank-yous from the people of Smallthorne to yours truly for his year-long endeavours as a Sentinel paperboy. It was about the excitement I felt when I heard my beloved nan and grandad arrive on Christmas Day morning on their Lambretta scooter. It was about pigs in blankets on my roast dinner, the rare treat that was turkey and watching the Top Of The Pops Christmas special. It was about reading Clement Clarke Moore’s enchanting poem Twas The Night Before Christmas. It was also about Santa Claus: That most mysterious of men who holds the dreams of so many children in his mittened hands. A few days ago I realised my childhood ambition and met the jolly old elf. Never growing up also means that I didn’t feel the cold – even though it was minus 20 – and was instead able to focus on the wonder that appeared before me. For as the snowmobile pulling our sled ground to a halt in the middle of the forest, there – in the semi-darkness of late afternoon in Lapland – loomed the most magical of sights. Three reindeer (presumably Dasher, Dancer and Prancer) were standing in the silence tethered to a sleigh. My daughter Lois’s face was a picture – a strange mixture of surprise, awe and elation. Her younger sister Mina was already scrabbling to exit the sled to take a closer look at the mythical beasts. This was why we had flown to the Arctic Circle. We saved up for it because it cost a small fortune and we won’t be going abroad again anytime soon. Still, it was worth every penny. The reindeer took us along a trail only they knew to a little cabin where Santa, seated by a roaring log fire, was waiting. Lois immediately ran over to give him a hug followed swiftly by Mina. 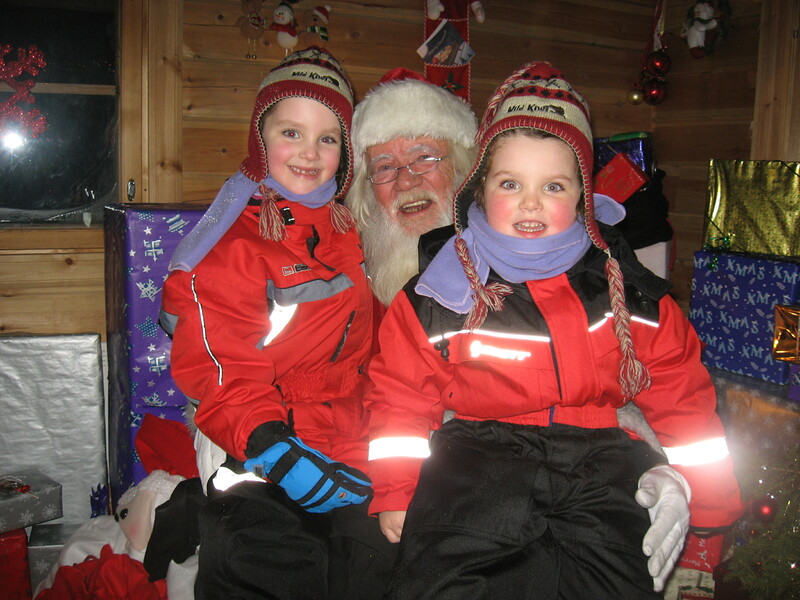 What followed was pure magic as my little ’uns eventually overcame their stunned shyness to tell Father Christmas how they had behaved this year and exactly what they wanted in their stockings. I defy even the most hard-hearted of humbug merchants not to have been melted by the moment. We also rode on a sled pulled by huskies and tobogganed for England but nothing quite compared with meeting the great man himself after 38 years of waiting. You see, it may be cold and it may be dark. We may be mithered about our jobs and be beset by financial problems. The immediate future may look bleak. But in a couple of weeks, for one day at least, we can forget our worries, be children once more, let Santa take the strain and embrace the spirit of Christmas. Take a pew (if you’ll pardon the pun), – it’s time for some uncomfortable truths about the church in 2010. Now, I’ll be the first to admit that these days I only set foot in the house of God for Christenings, weddings and funerals – or at Christmas time. I am, I suppose, a lapsed Methodist. That doesn’t mean I don’t pray or even that I don’t believe – I just choose not to worship regularly in the company of others. For the record, I attended church from the age of five until I was 14. I sat through years of Sunday school, joined the Boys’ Brigade and paraded the streets of Sneyd Green banging a side drum. I performed in annual stage shows, was part of the church Queen’s retinue (images of my frilly white shirt still haunt me) and always helped out at the fêtes at Wesley Hall Methodist Church. I eventually stopped going because I was bored and because, frankly, there were more interesting things to do on a Sunday morning. On the evidence of last Sunday I did the right thing. We rolled up at a United Reformed Church to witness our daughter’s first parade as a member of the Rainbows. For the uninitiated, the Rainbows is basically the junior section of the Brownies or Girl Guides. Our Lois is five and she and her mate Grace were resplendent in their red Rainbows jogging bottoms, red tracksuit tops and red baseball caps. They trooped into church along with other Rainbows, Brownies and members of the Boys’ and Girls’ Brigades. Lois was excited. She was thrilled to wear her new kit, to be with her new pals and to be part of a group activity. A little later a rather less enthusiastic Lois trudged out of the church doubtless wondering where the last hour of her life had gone. I knew exactly how she felt because I vividly remember fidgeting my way through countless services where, try as they might, the ministers spectacularly failed to engage with their flock. The man who led Sunday’s service for Lois was no exception. He seemed perfectly nice and shook my hand as we entered and left the church. However, his oratory was exceedingly dull and the moment when he produced two wholemeal baps and two tins of tuna as he told the story of Jesus feeding the 5,000 was surreal to say the least. I’m not saying the service was boring but little ’un (Mina), who is three and a half, fell asleep on her mum’s lap during the sermon. She snored so loudly that it drew disapproving glances from half a dozen parishioners. I think they were just annoyed that it was the most interesting thing that had happened during the entire service. Unless, of course, you include the video presentation by a charity working to relieve the suffering in Haiti. The one where there was no sound and we had to lip-read. As for the hymns, well, where to start? I remember a fair few hymns off by heart but only knew the first of four tunes we had to endure. It was that old favourite – Praise My Soul The King of Heaven – the words to which were written by H F Lyte in the early 19th Century. This is precisely the period many churches still appear to be stuck in. Let’s face it, many hymns – unless you include carols or those of the happy-clappy new variety – are dull as dishwater. Worse than that, they are a crime against music – completely devoid of any proper rhythm. So much so that you end up extending words beyond all recognition to keep pace with the turgid organ music. No doubt there are churches out there with vibrant congregations and lucky enough to boast preachers with real presence. However, I dare say they are in the minority which explains why so few people actually attend church regularly in the UK. More worryingly, the majority of those are in their twilight years and go to church out of habit, because they are seeking companionship or are hedging their bets on an afterlife. I dearly wish it wasn’t so. I honestly believe that the church has an important spiritual role to play in today’s fractured society. Indeed, I’m extremely grateful for the church’s role in my upbringing and I’ll certainly give my children the chance to go to Sunday school – if they enjoy it and feel they are getting something out of it. However, unless churches adapt and find ways to engage with younger generations, I fear the number of people through their doors will continue to dwindle. 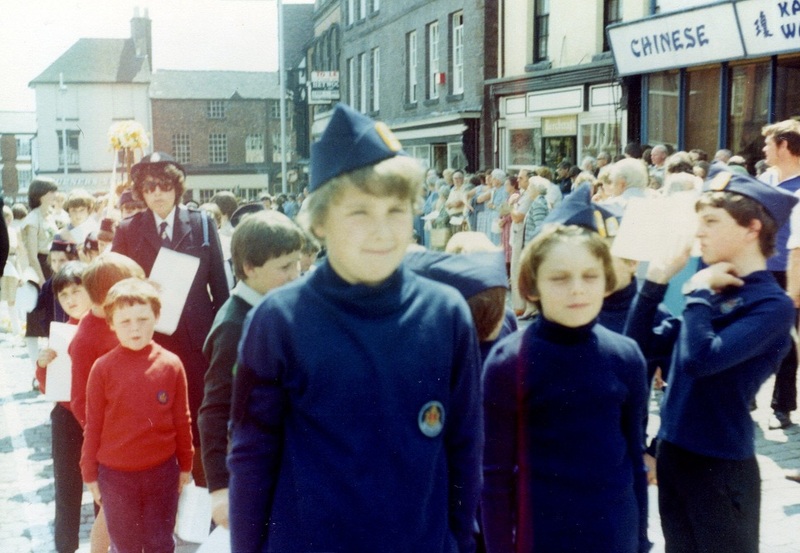 Yours truly, front and centre, during my Boys’ Brigade days. (My brother Matthew is left of me in the red Cabin Boys jumper. I can still remember the enormous sense of pride I felt at being awarded the Scripture Exam First Prize (with honours). Of course, my success was more down to having a decent memory rather than any great love of Bible stories – not that it mattered. I look back on the decade or so I attended Sunday school classes at Wesley Hall Methodist Church with great fondness. I recall marching around the streets of Sneyd Green once a month bashing the hell out of my side drum and hoping none of my much cooler mates noticed me wearing the blue uniform of the 14th (North Staffs) branch of the Boys’ Brigade. I remember sunny fêtes, the crowning of the church queen (yours truly was a page boy) and the annual concert where I was mesmerised by the rickety old wooden stage – which doubtless still has my chewing gum stuck to the underside of a plank in the top right hand corner. Happy days. I haven’t attended church regularly since I was a teenager. But that’s OK, according to the Bishop of Lichfield, who rode to the rescue of my soul this week. The Right Reverend Jonathan Gledhill says people like me, who attend church only occasionally, are not hypocrites. He is referring to the 38 million people who go each year to a C of E funeral service and the millions more who attend weddings and baptisms. The Bishop’s pastoral letter is refreshing in its honesty and shows a willingness to tackle those who sneer at organised religion and take cheap shots at the wayward flock. He knows full well that most people only attend church when they have an occasion to mark. And for many, this is more a case of duty and tradition than any great need for spiritual fulfilment. Basically, for many, the church service is the dull bit before they slacken their ties at the wake, christening party or wedding reception. It’s sad, but true. There are notable exceptions, but for years many churches have presided over dwindling attendances and the majority of worshippers have been older people who are seeking companionship or perhaps hedging their bets before the great hereafter. Some churches have resorted to playing cat and mouse with potential recruits who have to attend a certain number of services and prove they live within the locality before they are allowed to book a wedding or christening service at their preferred house of God. This is their rather unsubtle way of encouraging our continuing attendance. It doesn’t work, of course. Once the aforementioned do is out of the way, you don’t see most couples or their offspring for dust. The simple truth is they have better, or, what they perceive to be, more important things to do on a Sunday. Like going to Ladsandads football matches, trolling around garden centres or dragging the kids to B&Q. Having said all this, I’m in firm agreement with much of what the Bishop has to say. The church, or should I say the Christian Church in this country, has become a soft target for social commentators, which is a crying shame. The fact is, churches are nowhere near as popular as they once were as people now enjoy far more freedoms and choice than they did even 50 years ago. However, churches are just as relevant and important today, arguably more so, in fact, to a society battling against declining moral standards and in desperate need of some spiritual healing. And we should never underestimate their value as a focal point for much of what is wholesome and good in our lives. Whether we visit churches for parent and toddler groups or tea dances, use them to host functions or simply for the necessary bits before cracking open the bubbly and toasting our newlyweds or wetting the baby’s head, they are an essential part of the glue which binds our communities together. And we would be much the poorer without them. To me, religion is, and should be, a deeply personal thing. I believe in God and I value the religious education I received which supplemented what my parents and school teachers taught me. I enjoy attending church for special occasions involving family and friends. I don’t find it dull in the least – in fact, it is by far the best bit of the day for me. I cherish the Christmas services, the uplifting carols and the messages the church puts out during the season of goodwill. But by the same token, and it may be a cop-out in some people’s eyes, I feel no need to meet up with other Christians once a week to praise God and sing turgid hymns, or their happy-clappy modern counterparts. I pray each night, and that’s enough for me to feel in touch with God.